These words were stated by Tom Evans, Treasurer of the North American Division, during his Treasurer’s Report at the 2018 Year-End Meeting in Maryland. After more than 20 years of service as Treasurer in various parts around the NAD, Brother Evans recognized that God has financially blessed the NAD. Year after year, tithes have steadily increased, with 2018 reaching a record-breaking $1.2 billion in tithes. Indeed, as Brother Evans put it, “we are a rich Division.” Historically, the NAD has been the economic engine or “the bread basket,” as Dan Jackson stated, of the world church. However, that is about to change. Before 2012, the NAD was remitting 10.72% of the total received tithes to the General Conference to help fund the mission work of the less affluent territories around the world. After that, as the NAD received more, it began to retain more. As of 2018, the percentage remitted to the GC is 6.35% with the plan to bring it lower to 5.85% by 2020. Currently, the rest of the world church territories are remitting 2% of tithes to the General Conference. The decisions to give less during a time of plenty is contrary to the principles of biblical stewardship. In fact, the Bible teaches us to trust God by giving more even during a time of need. The widow’s two mites—She faithfully gave all she had, not less. Elijah and the widow’s oil—She faithfully trusted God and gave all she had, not less. Yet, with many beautiful promises and inspiring Bible stories like these, the NAD believes that, no, it is not better to give more to the world church. It is better that we receive and retain as much as possible. At the 2018 NAD Year-End meetings, the NAD President opened the floor for discussions about finances. The very first delegate brought a motion to the floor to give the NAD administration the authority to work with the General Conference to essentially make some arrangement to “financial parity” with the rest of the world church. In other words, that the NAD continues to give less and less to the world church until it is also equally giving what the rest of the world church gives, which at this point would be 2%. The motion included negotiations to make this happen within 5 years. Soon another delegate rose to the mic to amend the motion because 5 years is too long. “Make it 2-3 years,” he said. Delegate 1 on the mic: “Mr. Chairman, my heart was overflowing with joy when I was listening to the Treasurer’s report that our Division continues to receive more from its members. God indeed is faithful. As a pastor, it is my privilege and honor to serve Christ in ministry and get paid for it. Because of the faithful tithe givers in the NAD, I am employed full time and have been able to support my family comfortably while sending my children to receive an Adventist education with generous discounts. Our local church also is blessed with generous members. I recognize our Division consists of only 2% of the total membership of the world church, and yet we are contributing 42% of the total tithes received by the world church. Praise God for that! Let us continue to bear that responsibility joyfully while continuing to support the less financially fortunate parts of the world! Let us unselfishly give, for they need it more. What a difference! Unfortunately, this was not the case (for the most part). 1. We want to be treated equally like the rest of the world. Therefore, we also should give what everybody else gives (equal giving, not equal sacrifice). 2. Our church is dying. We need more money to grow our church (because more money will awaken our members spiritually. Giving 4% less to the GC is the solution to successful ministry). 3. “The system is broken” (meaning that it’s the GC’s fault for making them pay more). 4. Our local wealthy churches need the money (forget others in poor foreign fields). “We need more money to grow our church,” they say. However, statistics show quite the opposite. As more money is received, membership “growth rate” in the NAD is in a decline. Since 2009, the NAD has steadily been receiving a gain in tithes annually from its members (exhibit A), and as stated before, with a projected record-breaking $1.2 billion to be received in 2018. Yet, the rate of membership growth is decreasing (Exhibit B). In other words, while the NAD is increasing in members each year, it is doing so less and less. The concerning part is that at this rate the North American Division will soon be in a decline in membership. The wealthier we are, the poorer spiritually we become. So, more money cannot be the solution to the NAD’s problem. Here’s an interesting observation. 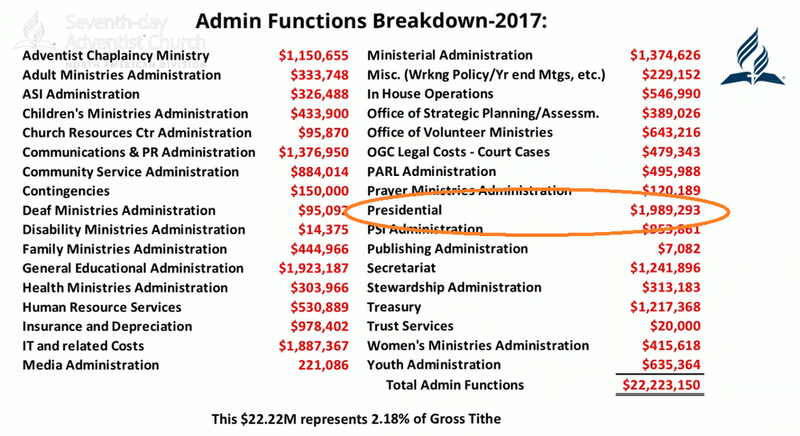 During the finance report, the presenter was breaking down the administrative expenses paid by tithe money received by the NAD for the year 2017. The elephant in the room was the whopping $1.9 million by Presidential (Exhibit C). How this money used, you ask? No delegate seemed to care. Or at least, no one was bold enough to question their leader. The NAD President wittily dismissed the elephant stating that when there is no place to put the money they put it in Presidential. He received the laughter desired (see video). Juan Prestol was given an opportunity to shed some light on a question regarding the impact this decision would do to the General Conference’s budget. Addressing the delegates, Juan told the members, “If what you want is parity, let me say a couple of things that you are not capturing. There’s no way for you to capture it because you don’t know it. Let me paint this to you so you can vote with some intelligence. You’re voting with your emotions (he may have been referring to their hurt feelings regarding to compliance document voted at the GC annual council). I want to put some intelligence in the picture,” he said. Quickly, groaning was uttered. The NAD President silenced them. Prestol continued, “Please allow the message to come through.” After explaining how the funds have been used by the GC in the past, Prestol eventually said what he was trying to avoid saying, “If you are going to vote the motion as you have it, number 1, it is out of policy, and I apologize for using that term. I realize [that this word] is not welcome. It is out of policy because tithe percentages are voted as a General Conference policy…Any changes need to start in 2020. I’m sorry, but I think you need to live with that.” Prestol continued to point out that the amended motion for parity within 2-3 years was too drastic and unrealistic besides being against policy. Leslie Louis, President of the Carolina Conference was against the amendment for two reasons. Elder Louis stated a similar point as the hypothetical ‘delegate 1 on the mic’. It is often the case that people have no problem spending other people’s money. But when it comes to having to dig deep into our own pockets, that’s another story. Reducing the amount of tithe sent to the GC will remove 500 missionary families from their field, in addition to many others at the GC losing their jobs, according to Prestol. And how many pastors or administrators in the NAD will lose their jobs by this decision? Not one, it seems. I wonder, why isn’t any delegate is in favor of their salary being reduced for the sake of the growth of the church if they are so much concerned for it? Yet, this was not the case. Before the final vote, the NAD President reminded the delegates to vote ‘yes’ if ‘yes’ was the answer to the following three questions. 1. Will it advance the mission of the NAD? 2. Will it pass the Christlikeness test? 3. Will this decision be consistent with biblical principles? The vote passed 155 yes, 75 no. “If we ever lose the spirit of giving, we will just go downhill” — Tom Evans. Deyvy Rodriguez is South Texas Field Representative for the Texas Conference of Seventh-day Adventists.